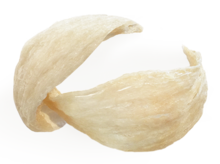 Edible bird's nests are bird nests created by edible-nest swiftlets, Indian swiftlets, and other swiftlets using solidified saliva, which are harvested for human consumption. They are particularly prized in Chinese culture due to their rarity, supposedly high nutritional value, and flavour. Edible bird's nests are among the most expensive animal products consumed by humans, with nests being sold at prices up to about $3,000 per pound ($6,600/kg), depending on grading. The type or grading of a bird's nest depends on the type of bird as well as the shape and color of the bird's nest. It is usually white in colour, but there also exists a red version, sometimes called "blood" nest. The Chinese believe that it promotes good health, especially for the skin. The nests have been used in Chinese cooking for over 400 years, most often as bird's nest soup. The Chinese name for edible bird's nest, 燕窝 [yànwō], translates literally as "swallow's (or swift's) nest"; in Indonesia "sarang burung walet" often serves as a synonym for bird's nest soup. The best-known use of edible birds nest is bird's nest soup, a delicacy in Chinese cuisine. When dissolved in water, the birds' nests have a gelatinous texture used for soup or sweet soup (tong sui). It is mostly referred to as 燕窝 (yànwō) unless references are made to the savoury or sweet soup in Chinese cuisine. According to the Qing Dynasty manual of gastronomy, the Suiyuan shidan, bird's nest was regarded as a delicate ingredient not to be flavoured or cooked with anything overpowering or oily. And while it is precious, it must also be served in relatively large quantities otherwise its texture cannot be fully experienced and enjoyed. In addition to their use in soup, edible bird's nests can be used as an ingredient in other dishes. They can be cooked with rice to produce bird's nest congee or bird's nest boiled rice, or they can be added to egg tarts and other desserts. 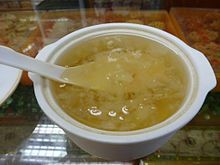 A bird's nest jelly can be made by placing the bird's nest in a ceramic container with minimal water and sugar (or salt) and double steamed. The most heavily harvested nests are from the edible-nest swiftlet or white-nest swiftlet (Aerodramus fuciphagus) and the black-nest swiftlet (Aerodramus maximus). The nests are supposedly rich in nutrients, which are traditionally believed to provide health benefits. Most nests are built during the breeding season by the male swiftlet over a period of 35 days. They take the shape of a shallow cup stuck to the cave wall. The nests are composed of interwoven strands of salivary cement. Both nests have high levels of calcium, iron, potassium, and magnesium. The nests were formerly harvested from caves, principally the enormous limestone caves at Gomantong and Niah in Borneo. With the escalation in demand these sources have been supplanted since the late-1990s by purpose-built nesting houses, usually reinforced concrete structures following the design of the Southeast Asian shop-house ("rumah toko"/"ruko"). These nesting houses are normally found in urban areas near the sea, since the birds have a propensity to flock in such places. It has become an expanding industry as is evident in such places as the province of North Sumatra or the Pak Phanang District in Thailand. From those places the nests are mostly exported to the markets in Hong Kong, which has become the centre of the world trade, valued at around HK$2 billion per year, although most of the final consumers are from mainland China. China is the world's largest consumer of birds' nests, accounting for more than 90 percent of consumption. Indonesia is the largest bird's nest producer in Southeast Asia, exporting around 2,000 tonnes per year, followed by Malaysia at 600 tonnes, and Thailand, 400 tonnes. The Philippines, around five tonnes per year, is the smallest producer. Bird's nest industry in 2014 accounts for 0.5 percent of the Indonesian GDP, equivalent to about a quarter of the country's fishing industry. In Thailand, the trade value of bird's nests, both wild and "farmed", is estimated at around 10 billion baht per year. The industry globally is an estimated US$5 billion. Hong Kong and the United States are the largest importers of nests. In Hong Kong, a bowl of bird's nest soup would cost US$30 to US$100. A kilogram of white bird's nest can fetch up to US$2,000, and a kilogram of red nests up to US$10,000. The white nests can be treated with red pigment to defraud buyers, but methods have been developed to determine an adulterated nest. Natural red cave nests are often found in limestone caves in Pak Phayun District, Thailand. The high returns and growing demand has attracted counterfeiters, leading to the halt of Malaysian nest exports to China. The Malaysian government has since employed RFID technology to thwart counterfeiting by micro-chipping nests with details about harvesting, packaging, and transport. Industrial quality-control techniques such as failure mode and effects analysis have been applied to bird's nest processing at nesting houses in Sarawak, Malaysia and reported by a research team at Universiti Malaysia Sarawak. Because a bird's nest is an animal product, it is subject to strict import restrictions in some countries, particularly with regard to H5N1 avian flu. In Canada, commercially prepared, canned, and sterile bird's nest preparations are generally acceptable, but may be subject to restrictions. ^ a b c d Marcone, Massimo F. (1 July 2005). "Characterization of the edible bird's nest the 'Caviar of the East'". Food Research International. 38 (10): 1125–1134. doi:10.1016/j.foodres.2005.02.008. ISSN 0963-9969. ^ "eBay search: edible bird's nest, sold". Retrieved 7 March 2017. ^ Maierbrugger, Arno (20 August 2013). "Vietnam seeks investors for edible bird's nest industry". Inside Investor. Retrieved 20 August 2013. ^ "Seafoods 1: Bird's Nest (燕窩)". Translating the Suiyuan Shidan. 2014. ^ Gausset, Quentin (2004). "Chronicle of a Foreseeable Tragedy: Birds' Nests Management in the Niah Caves (Sarawak)". Human Ecology. 32 (4): 487–506. doi:10.1023/b:huec.0000043517.23277.54. ^ "Inside of a Successful Bird's Nest House". House of Bird's Nest. Retrieved 9 January 2014. ^ a b c d e Panyaarvudh, Jintana (11 October 2018). "An economic nesting ground". The Nation. Retrieved 12 October 2018. ^ "Vietnam Seeks Millions for Edible Bird Spit Industry". Bloomberg News. Retrieved 9 January 2014. ^ a b Park, Therese (8 February 2005). "Bird-nest Soup, Anyone?". Koreabridge Writings. ^ "Chinese Delicacy Tagged with RFID". RFID World. 30 June 2012. Retrieved 20 January 2013. ^ Jong, Chian Haur; Tay, Kai Meng; Lim, Chee Peng (August 2013). "Application of the fuzzy Failure Mode and Effect Analysis methodology to edible bird nest processing". Computers and Electronics in Agriculture. 96: 90–108. doi:10.1016/j.compag.2013.04.015. ^ Tay, Kai Meng; Jong, Chian Haur; Lim, Chee Peng (July 2014). "A clustering-based failure mode and effect analysis model and its application to the edible bird nest industry" (PDF). Neural Computing and Applications. 26 (3): 551–560. doi:10.1007/s00521-014-1647-4. ^ Chang, Wui Lee; Tay, Kai Meng; Lim, Chee Peng (Nov 2015). "Clustering and visualization of failure modes using an evolving tree". Expert Systems with Applications. 42 (20): 7235–7244. doi:10.1016/j.eswa.2015.04.036. ^ "Egg Products - Import Procedures". Canadian Food Inspection Agency. 2014. Retrieved 29 July 2014. Jordan, David (2004). "Globalisation and Bird's Nest Soup". International Development Planning Review. 26 (1). Archived from the original on 21 October 2008. Lau, Amy S. M.; Melville, David S. (April 1994). International Trade in Swiftlet Nests with Special Reference to Hong Kong. Traffic Network. ISBN 978-1-85850-030-0. Jong, Chian Haur; Tay, Kai Meng; Lim, Chee Peng (August 2013). "Application of the fuzzy Failure Mode and Effect Analysis methodology to edible bird nest processing". Computers and Electronics in Agriculture. 96: 90–108. doi:10.1016/j.compag.2013.04.015. Tay, Kai Meng; Jong, Chian Haur; Lim, Chee Peng (April 2015). "A clustering-based failure mode and effect analysis model and its application to the edible bird nest industry" (PDF). Neural Computing and Applications. 26 (3): 551–560. doi:10.1007/s00521-014-1647-4. Chang, Wui Lee; Tay, Kai Meng; Lim, Chee Peng (Nov 2015). "Clustering and visualization of failure modes using an evolving tree". Expert Systems with Applications. 42 (20): 7235–7244. doi:10.1016/j.eswa.2015.04.036. Chai, Kok Chin; Jong, Chian Haur; Tay, Kai Meng; Lim, Chee Peng (Aug 2016). "A Perceptual Computing-based Method to Prioritize Failure Modes in Failure Mode and Effect Analysis and Its Application to Edible Bird Nest Farming". Applied Soft Computing. 49: 734–747. doi:10.1016/j.asoc.2016.08.043. Jandam, Kasem (April 2017). Ethnicity and birds' nest resources in Southeast Asia. Thailand Research Fund (TRF). ISBN 978-616-7474-53-3. Retrieved 12 October 2018. This page was last edited on 14 April 2019, at 06:02 (UTC).